Regulation of cellulose biosynthesis in developing Xylem (C.H. Haigler, et al.). Xylem formation and lignification in trees and model species (E. Pesquet, et al.). Spatial and temporal regulation of lignification during tracheary element differentiation (Y. Sato). Final and fatal step of tracheary element differentiation (A.M. Jones, et al.). Arabidopsis as a model for investigating gene activity and function in vascular tissues (E.P. Beers, Chengsong Zhao). Molecular mechanisms of vascular pattern formation (H. Fukada, et al.). The asymmetric leaves2 (AS2) gene of arabidopsis thaliana regulates lamina formation and is required for patterning of leaf venation (E. Semiarti, et al.). Biosynthesis of cellulose (I.M. Saxena, R.M. Brown, Jr.). Functional analysis of polysaccharide synthases responsible for cell wall synthesis in higher plants (R.A. Burton, D.M. Gibeaut, G.B. Fincher). Analysis of secondary cell wall formation in arabidopsis (S.R. Turner, N.G. Taylor, L. Jones). Organization of cellulose-synthesizing terminal complexes (K. Okuda, S. Sekida). Regulation of dynamic changes in cell wall polysaccharides (N. Sakurai, N. Nakagawa). Microfibrils build architecture: a geometrical model (A.M.C. Emons, B.M. Mulder). Occurrence of high crystalline cellulose in the most primitive tunicate, appendicularian (S. Kimura, T. Itoh). The role of cortical microtubules in wood formation (R. Funada). Xylan and lignin deposition on the secondary wall of fagus crenata fibers (T. Awano, K. Takabe, M. Fujita). Isolation of monoclonal antibodies recognizing xylem cell wall components by using a phage display subtraction method (N. Shinohara, T. Demura, H. Fukada). On the mechanism to regulate the ratio of syringyl to guaiacyl moieties in lignin (K. Fukushima). The behavior of exogenous sinapic acid in the differentiating xylem of angiosperm (K. Yamauchi, S. Yasuda, K. Fukushima). Functional analysis of phenylalanine ammonia-lyase gene promoter of poplar (M. Oyanagi, Y. Ozeki). Xylem peroxidases: purification and altered expression (J.H. Christensen, et al.). Immunolocalization of enzymes involved in lignification (K. Takabe, et al.). Lignin biosynthesis in poplar: genetic engineering and effects on kraft pulping (W. Boerjan, et al.). Analysis of transgenic poplar in which the expression of peroxidase gene is suppressed (N. Morohoshi, et al.). Transcriptional regulation of lignin biosynthesis by tobacco lim protein in transgenic woody plant (A. Kawaoka, et al.). Genetic engineering of pinus radiata and picea abies, production of transgenic plants and gene expression studies (C. Walter, et al.). Analysis of wood development with a genomic approach: eucalyptus ests and tac genomic library (S. Sato, et al.). Modifying populus environmental responses: impacts on wood quantity and quality (R.B. Hall, E.R. Hart, I. Peszlen). Two insect-resistant genes were transferred into poplar hybrid and transgenic poplar show insect-resistance (Hongyu Rao, et al.). Modification of flowering in transgenic trees (R. Meilan, et al.). Possible approaches for studying three dimensional structure of lignin (N. Terashima). Involvement of peroxidases and hydrogen peroxide in the metabolism of &bgr;-thujaplicin in fungal elicitor-treated cupressus lusitanica suspension cultures (Jian Zhao, K. Sakai). A factor controlling &bgr;-thujaplicin production in suspension culture of cupressus lusitanica (J. Yamada, K. Fujita, K. Sakai). Endogenous plant hormones in protoplasts of embryogenic cells of conifers (H. Sasamoto, S. Ogita). Efficient plant regeneration of larix kaempferi (S. Ogita, H. Sasamoto). 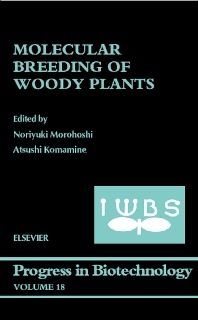 Somatic embryogenesis of Japanese conifers (K. Ishii, E. Maruyama, Y. Hosoi). Application of somatic embryogenesis to tree improvement in conifers (D.R. Cyr, et al.). Somatic embryogenesis and plantlet regeneration in pinus armandii var. amamiana (Y. Hosoi, K. Ishii). Plant regeneration from somatic embryos in pinus thunbergii (Japanese black pine) and pinus densiflora (Japanese red pine) (T. Taniguchi). Concepts and background of photoautotrophic micropropagation (C. Kubota). Photoautotrophic micropropagation of tropical and subtropical woody plants (Q.T. Nguyen, T. Kozai). Large-scale photoautotrophic micropropagation in a scaled-up vessel (S.M.A. Zobayed, et al.). Mass-propagation of coffee from photoautotrophic somatic embryos (F. Afreen, S.M.A. Zobayed, T. Kozai). Automation in somatic embryo production (Y. Ibaraki). A closed-type transplant production system (Changhoo Chun, T. Kozai). Photoautotrophic micropropagation of rhododendron (C. Valero-Aracama, et al.). At present, plants and agricultural sciences are playing a leading role in providing solutions to problems created by an ever growing world population. Through plant biotechnology scientists are seeking ways to improve crop functions that rapidly promote food production. Agricultural science is being used to experiment with producing plants tolerant to environmental stresses such as drought, salinity and coldness. Of the plant species, woody plants are producing the most abundant biomass resources, playing important roles in the suppression of carbon dioxide increase and supplying huge energy and resources to human beings in the biosphere. These Proceedings discuss the recent results of fundamental and applied research for global resource and energy, biomass production and environmental problems from the aspect of woody science.